We love how simple and fun this card project is to make, follow our step by step instructions as we show you two ways to style your wreath card. 1. Cut a piece of red cardstock to 14.5x14.5cm , mat and layer with a piece of heart paper cut to 14x14cm. 2. Stick a white doily to the centre of the card. 3. Cut a 7.5cm circle of thick card with a centre hole of 5cm. 4. Cut 1x3cm strips of paper from a variety of backing papers, wrap around the circle to form the wreath. 5. Add the ribbon bow and brad to the top of the wreath, decorate the wreath with gems and add the sentiment to the card. 6. Adhere the wreath to the doily and mount the card on a 6x6 white card blank. 1. Cut a piece of red gingham backing paper to 12x12cm, distress the edges and fix to a 5x5cm kraft card. 2. Make the wreath as before, then adhere to the centre of the card using foam squares for depth. 4. Add gems to the bottom left and top right of the card to finish. 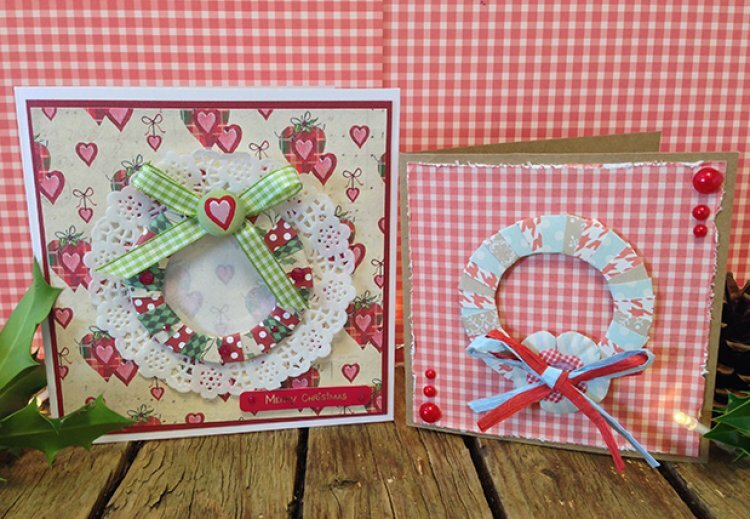 We hope you like our 3D wreath card layout, if you make this card please share in the Project Gallery.